Okay. So we've been at this whole potty training thing for a while now. Like, close to two years to be precise. I try really, really hard to be relaxed and not stress myself out. At age 2, it wasn't even in my realm of thinking. Age 3, we started working on it, but I wasn't too worried. Age 4, we got more serious, then lost some momentum, got bored, got motivated again, slacked off, and didn't really see a whole lot of progress. That's when I started to realize that perhaps THIS was another thing that just wasn't going to come easily like it does for MOST people. Now they are 5. And I am trying really, really hard not to freak out. Holland is potty-trained during the day. She wears underwear to school, and did all last year as well. She used to have a few accidents a week, and would ONLY go potty when we gave her frequent reminders and basically MADE her go. She is just now getting to the point where accidents are much less frequent, and she is making it to the potty on her own accord. She is NOT however, potty-trained at night. She wears a diaper to bed and wakes up every morning soaked. She sleeps very soundly, and hasn't shown ANY signs that she is ready to wake herself up and go to the bathroom during the night. I have no idea what to do. Eden is still in the hit-or-miss stage. She wears a pull-up during the day. The only way she can stay dry is if we take her to the potty every hour, and even then, she may have an accident. We made quite a bit of progress in the potty department last school year, and had a pretty good pattern going on. Unfortunately, near the end of the school year, her one-on-one aide had to be out for a few weeks, and I truly think I saw a regression in the potty-training at that point, even at home. Then, for several months, we made no progress at all. She was back to pooping in her pull-up on a fairly regular basis, unless we got lucky. 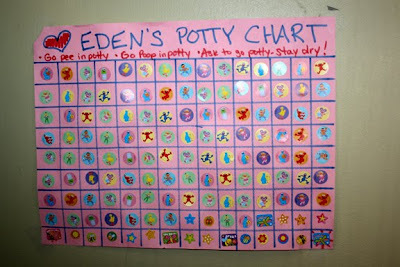 We reinstated Eden's potty chart near the end of July. I tried, at the same time, to start a "chore chart" for Holland so that she could work toward a goal as well, but it was SO much drama...Eden couldn't stand that Holland got stickers for chores, and thought she should get stickers for chores too, and it detracted from the whole goal of potty-training, so I had to do away with Holland's chart, and just let Eden work on potty-training. Really, it was pathetic, Eden crying big crocodile tears saying, "I can clean up my toys too!!! I don't want to go potty. I want a chore chart TOOOOOOO!" I just couldn't take the drama. So anyway, back on topic... Eden was able to earn a sticker on her chart for every time she peed, pooped, asked to go potty and actually went, and was still DRY. So, she could potentially earn up to 4 stickers at a time. When she reached one of the small stars on the chart, she and Holland could pick a small (dollar store) prize out of the prize box. When she got to the BIG star at the end of the chart she earned a trip to the TOY STORE to pick out a BIG prize. It started kinda slow, but after a little while she got the hang of it and started making progress again. It took her about two months to make it to the end of the chart and to earn her BIG prize. So, where are we now??? It's still hit or miss. Most of her poop (like 80-90%) is making it to the potty. She asks to go potty a lot more often, and experiences a lot more success. If she says she has to go, about 90% of the time she really does. The problem is that about 50% of the time, she is still wet when we get to the potty. We have tried on multiple occasions to put her in underwear, but she just can't seem to hold her pee for long enough to really be successful at it. Like, literally, she will have an accident within a half hour after using the bathroom. We'll try again, and within another hour, another accident. I am at a loss. They are 5 years old. Cognitively, Eden completely understands the concept, and knows what she is supposed to do. I find myself getting frustrated with her, especially with big accidents (poop), but then she will apologize profusely, and I feel like a total schmuck for giving her any grief. At what point do I stop trying to get her in underwear and just accept the pull-ups? I have always assumed that it is possible for her to be potty-trained, but what if it isn't? How do I know? I don't want to push the issue if it just isn't physically possible for her to control those muscles that are necessary for her to hold it and control her bladder. But, at the same time, I have heard from multiple sources that there is no reason she should not be potty-trained. Apparently some people believe you can potty-train anyone, even kids with very significant impairments. And what about the potty-training at night thing? I'm feeling some real pressure...stemming from cultural expectations, the feeling like someone might judge me as a bad parent for not having my kids potty-trained at AGE FIVE, like maybe I have absolutely no clue what I am doing despite years of training in behavioral psychology....and on and on. I'm at a loss. Anybody out there have any ideas? I'm open to anything...but would especially love to hear some success stories from families in a similar situation. Has anyone experienced success at FULLY potty-training their child with a physical disability after the age of five??? You have the right idea! Potty training, like most of child-rearing, is a "two steps forward, one step backwards" adventure. One thing to keep in mind when it comes to nighttime dryness is that there's no correlation between desire to be dry at night and ability to be dry at night. Even if Holland WANTS to be dry at night, she's obviously not ready. As our pediatrician pointed out when my first 4 were growing up: "Night time wetting is a laundry problem not a medical problem. Some kids just aren't there physiologically yet. They'll get it." They have to be able to produce enough of a hormone (sorry, can't remember which one!) to stay dry at night. It WILL happen. They WILL be dry at night. Someday. It might not be until they are 6 or 8 or even 12 or 15, but it WILL happen. (Trust me--I speak from experience. And children who were still wetting the bed at 10.) Hang in there. mom to 6--2 in college, 2 in high school, and 2 in preschool. I'm glad you asked this Billie, I was wondering what the protacol is for kids with a handful of disabilities, specifically Annabel for us if/when we might expect to be able to start potty-training her. The other 2 are close, Mady is telling us when she goes poop or pee now and Johnathan is such a copy-cat that he won't be far behind once she gets it. Hopefully you'll get some good answers here and if you discover something that works well please let me know! In the meantime hang in there, I know how frustrating it is when there's something you know they should be able to do but they're not. Long-time lurker, delurking to say that I certainly don't have any advice, but rather I simply have admiration for you. Potty training can be so frustrating even in the best circumstances; your patience and compassion with your girls is inspirational. I wish I knew you in real life. Hello! My daughter has spina bifida, with tethered spinal cord. It was de-tethered surgically and we have experienced quite a bit of success with walking etc, but the potty training is proving very difficult! I think we have been potty training on and off for a year? Same story - it seems like she is always wet. Sometimes a little, sometimes a lot. Lots of accidents, or one good potty trip, then an accident 20 mins later. No rhyme or reason, it feels like. Like Eden, I feel my daughter is a smart little girl, shouldn't we be able to figure this out? We see a urologist now. do you guys? I just love having someone who HAS TO listen to my endless poop saga, lol. Anyway, I get the feeling there is a definite issue with sensation - if you can't feel that signal, how do you know you need to go? I am not sure my daughter can feel it. She is a little younger so we are still taking a wait and see approach... but I am feeling super demoralized these days, as I head to Costco for another jumbo pack of disinfecting wipes... SO tired of accidents. As for Holland, do you take her for a potty trip before you head to bed? That worked with my older one. Potty before they go to bed, then when I go, around eleven, I walk that sleepy child to the bathroom! Sounds so cruel, but they are half asleep, they fall back off easily enough. It helped us a lot with diaper flooding issues we had. Then I think that just got it into her head and eventually she started taking some initiative. I dont have a child with a disability but I can tell you that my sons who are 5 1/2 and (almost) 7 are still not dry at night. Both of them were completely day trained at age 3, totally dry, no accidents, nothing. But at night? No way. My 5 year old wears a pull up to sleep and wakes up with it VERY wet. My 7 year old also cannot stay dry a whole night, but he's not as bad, so we just wake him every night at around midnight and take him to the bathroom. IF we didnt do that, he would wake up soaked. Ive spoken to the doctor about this and she told me its pretty common and not to worry about it until they are older than 7. So i guess i'll start to worry soon! but truthfully, i think its kinda genetic sometimes, my husband had the same issues when he was young, and I also know other kids this age who have the same issue. 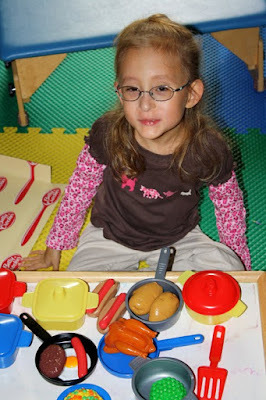 About Eden...I dont know anything about potty training a disabled child so i cant be of any help there. im sorry. :( maybe she just needs more time? maybe those muscles are a little weak and she needs to learn to use them? just a thought, again, i have no clue! Good luck with those adorable girls!!! Hi, I am a twelve year special education teacher working with kiddos whom, from your descriptions, have more significant disabilities than your girls. I have successfully potty trained and "schedule" potty trained non-verbal kiddos as old as 12-17 years old, most to wearing underwear in the day and pull ups at night, some to underwear all the time and some to pull ups all the time. It CAN be done. Somethings to thing about would be: a visit to the urologist to rule out spastic bladder, underlying infection and other conditions. This will relieve any guilt you have around pushing this and will ensure that the girls don't have any other issues making it harder. You may want to consider that often times a pull up/diaper never feels wet. They are designed not to feel wet. It is inconvenient and messy, but if this is/may be part of the problem then wearing underwear on the inside, or a fabric liner (cut up strips of wash cloth) on the inside, or trying underwear (during the day) and dealing with the mess might be the way to go. They do sell enuresis alarm that beep or vibrate at the first drops of urine in underwear or a diaper. I have never used them, but I know others who have. It is something to consider. As to nighttime dryness, my professional recommendation would be to try to teach Holland how to wash herself up to some degree and change herself, shooting for independence where you can. No shame or blame, just an expectation that she is a big girl, accidents happen, and here is what she should do. Try not to sweat it too much, any anxiety kids pick up around this issue can prolong the process. I once had a high school aged student (a former preemie who had very involved spastic CP) with who was 100% trained from about age 6 but could not urinate with a certain paraprofessional in the restroom with her because that paraprofessional just made her too anxious! Rebekah wasn't potty trained until age five, either. It's just the fact that the muscles that hold in the pee and poop, due to CP, aren't as strong as a person's without CP, and therefore can't hold things in as easily. She'll get there, it just takes a lot more time than a kid without CP. And she most likely will have to take MANY many trips to the bathroom when she is fully potty trained. There have been days when we've had to take trips every half hour. Sometimes she just doesn't empty her bladder all of the way the first time, so she's back on the toilet again ten minutes later. It's something that takes a lot of time, and really isn't something to stress about. Hang in there, it'll come when they're ready! Melanie who writes the blog Better Than Normal started documenting the potty training process with her son who has CP. I remember that the first thing she did was keep a journal for about two weeks that documented the state of the diaper every hour. Looking for patterns that would help her get her son to the bathroom at the right times. I agree with other who suggested that a trip to the urologist/kidney doc might be in order. Charlie was catheterized for the first two weeks of life and for a while after that, his bladder didn't hold urine properly. Wasn't a big deal since he was a tiny baby, and it seems to have corrected itself, but I do think a trip to the doc would get you off to a good start. I also love the suggestion that a a washcloth or something similar might enable the girls to better feel when they are wet. I've read several places that today's diapers and pull-ups actually prolong the potty training process because they don't allow the children to feel wetness. This is a great topic and I look forward to hearing what other parents have to say. I have 5 year old fraternal twin girls and one has a bladder of steel (I swear she can go hours without peeing) but her sister is another story. They started kindy this year and I basically had her wear skorts to try to camoflauge the dampness so she wouldn't be embarrassed. She didn't have full blown pee accidents, just dampness/leaking numerous times a day. No matter what I did - beg, fuss, reward, etc., nothing worked. She'd go potty and then be wet 20 minutes later. She also had trouble feeling the urge to pee and would make it to the bathroom too late. I kept thinking she needs time to mature, she'll get it but in the meantime I thought I was going to go crazy. On my ped's recommendation we went to see a urologist. He tested for a UTI and did an ultrasound after she went to the bathroom to be sure she was voiding her bladder completely. Everything came back normal so his determination was immature bladder. He prescribed Detrol LA. Can I just tell you thsi medication has changed my life! She still needs prompting to go to the bathroom but she's able to hold her urine for soooo much longer. The first day she came home from school dry I hugged her and told her how proud I was and she just beamed. You may not want to consider medication but I just wanted to mention this to you as it has truly been a miracle for us. I used to stress so much about outings, school field trips, trips to the mall since I didn't want to worry about accidents and it's nice to put that behind me and the benefit to my daughter's self-esteem has been tremendous. I think you would benefit from a trip to the urologist to see what options may be available to you. I haven't even tried night time potty training and don't plan on anytime soon. I'm lazy, I admit it and don't want to deal with the laundry. She's got bed-wetting genes coming from both her father and myself so I know she doesn't stand a chance of staying dry at night anytime soon. Bottom line don't let anyone make you feel bad for where you're at with your potty training. Every child is different and they're all going to get there eventually. Hi there Billie! How often does she drink during the early evening? We restricted my eldest son's drink from say 6.30 pm to only a few sips of water when he was thirsty and no "comfort" drinking. I also woke him up at 11 pm for a last wee before I went to bed. Regards Mandie for SA. With all the kids I babysit for, the parents have me not give drinks to the potty training baby past 5 (that is two hours before they go to bed). Usually if they seem to express any thirst at all I give them a little something and they're happy. I take them to bathroom at 5, then again before they sleep at 7 (and even when they say they don't have to pee before they go to sleep, they ALWAYS do for me once you sit them on the toilet). Stick them in bed in pull-ups and make them go to the bathroom when they wake up at 7 the next day! I've known at least a dozen different mothers to do this with their babies and I'm pretty sure all of them were dry through the night by 3 or 4. With Eden, I'm not sure what advice to give...just wanted to say I hope she keeps up the great work! Maybe she just needs some more time staying at where she is now before more progress can be made. Hi Billie, you don't me either, I'm an ex-physical therapist, worked with CP kids. I agree with the folks who've said get a urology check for both girls, it will rule out any underlying problems and help you plan what to do. Even 'normal' kids are vastly different here. My older son was dry day and night aged twenty months with no training whatsoever. His brother was dryish days aged 7, and nights, well, he's 17 now and has had one accident this year. He was diagnosed age 10 with a spastic bladder, given medi which changed his life tho nights were still hit and miss, came off it last year, and I think we're about 'there' now. I think your girls will make it too, loads of CP kids do, but I think they both still need time. Do whatever minimizes the 'stress' for you. They'll be fine with that. I think rewards are fine as long as you don't set goals you might not meet. I think you're doing absolutely brilliantly with them, your gut instincts are spot on. And they are such loves, thank you so much for sharing! Hey Billie, long time lurker, first time commenter! I just wanted to let you know that my non-disabled 5 year old is also still wearing a pull-up to bed at night. She just seems to sleep too deeply to wake up. My doctor said most parents would be surprised to find out how common it is - and that is with children who do not have a disability. I think you are doing amazing! Sorry from Rosalind above - showing up my own 'disability', I can't add 2+2 and get 4... My first son was thirty months, 2 1/2 years, when he was dry... not 20 months. To add to what Sarah just wrote, our doc said 10% of 6 year olds aren't trained, and 6% of 10 year olds. And in every primary school class there is AT LEAST one child not dry nights. It is very common. Here comes reassurance on the Holland front: S's BFF, who is a completely typically developing child only 2 weeks younger than your girls, still wears a pullup at night and wakes up soaked every morning. Night wetting, as I understand it, has everything to do with the body and nothing to do with the brain (as other commenters have pointed out). S was also VERY similar to H in terms of the trajectory of training. For almost TWO YEARS she would only go if we reminded her, it was a huge power struggle, etc. It's really only in the last couple of months that she's started taking the initiative herself. Girl is a CAMEL - she can hold it for 14 hours. But she'll do almost anything for a temporary tattoo, so we bribed her and for months she looked like she belonged on LA Ink. Do you have any idea if Eden's trunk tone could be impacting her ability to "hold it"? I think the disconnect between cognitive readiness and physical readiness is pretty common. Everyone seems to be saying sensible things.I agree about the not feeling it problem with pullups, some disposable ones have a special wet sensation, which ,ight be good. You might be eligible for help with the cost of diapers etc from you state/ local authority. Most places do this after the age of 5. I have know many of kids with disabilities mange or not mange some form of continence at many different ages. Everyone's different. My brother was walked to the toilet at night when my parents went to bed until he was about 10 and my cousin wore dry nights to that age too. Waking up at night to use the bathroom is a learned skill. I would put her in GoodNights and not worry about it anymore until she is 8. If she is still wetting consistantly every night then, then it might be time to see a doctor. Hi! One of my twin daughters, who will be SEVEN in January, STILL wets the bed at night! She does have a neurological disorder which causes her fine motor skill problems, but this shouldn't cause her any problems with staying dry through the night. She was potty trained (waking hours) at three years old. I'm at a lost too! Her ped said I could give her a pill at age seven to keep her dry through the night. I have my doubts that it will work, but I'm getting desperate! Good luck! I just want to chime in with another response that I have a big kid who is not dry at night. My 6.5yo needs his pull-up at night in a big way. He has been fully trained in the day since he was 2.5! Even his little brother, who is 3, wears underwear at night! I sort of feel like, if I wanted to push it, I could try things like limiting fluids after 4pm and getting him up in the night to go potty. Or, I could just keep putting a pull-up on him so that we can all drink and sleep as much as we want to! Yay for drinking and sleeping! The nighttime thing doesn't bother him, and it doesn't bother me, so I don't see a problem. Eden's issues do sound more complicated. If she were younger and didn't have CP, I would say put her in underwear, reward her for every half hour that the underwear is dry, and get her to help with the cleanup of accidents when it's not. Those were the things that helped when training my three kids. But if there's a chance that it is an actual physical limitation, then maybe the techniques are different. My 5 boys varied in their potty training schedules. One was 11 before he stopped night wetting, a problem my brother as well as my husband also had when they were kids. The best method I saw out their was the "Potty Training in a Day". There is a section in that book regarding disabled kids. Yes, always rule out medical reasons before starting on such regiments. My youngest was addicted to pull ups. As others have said, he was so used to peeing in them and they were so nicely soaked up, that he did not have learn to be aware of when he was going. A day of NO pullups, underwear, or anything, spent in the kitchen fixed that. He was horrified when the pee came out a splattered him and the floor. He quickly learned the signs of an upcoming leak ( the whole thing was sped up by lots of fun drinks that day) and would run to his potty chair. He finally learned to hold it because he hated the sensation. With the pull up, he felt little or nothing. Eden is in a chair so you would not have an absorbable cushion on it so she can see what happens when she does not "Catch" that pee before it starts. Our kids' beds for years were encased by plastic, covered with a cheap mattress pad, and then a cheap comforter. No top sheet, just another comforter. I bought hundreds of inexpensive comforters at thrift shops, garage sales, clearance sales and took hand me downs since my boys slept in comforter sandwiches. If they wet through at night, it was easy to throw two more comforters on the bed after removing the wet/soiled ones. All comforters were machine washable and could fit in our washer. We still don't use top sheets as it makes bed making easier that way. I'm (another!) lurker here, but I'll comment on this one. My sister (doesn't have any physical disabilities though) was day-time potty trained by about age 3. The thing is, she wasn't reliable at night time until about age 10. But she got there. She sounds a lot like Holland, sleeps like an absolute rock. I work at a Girl Scout camp in the summers and as a nanny during the year, and I've worked at two day cares. I've worked with several disabled kids. I had two girls at camp in wheelchairs (not at the same time), one of whom had CP. She'd typically let us know when she had to go on her own, but we just had to keep it in the back of our minds to remind her if she hadn't gone in a while. She was 8 I think. Obviously each kid is different, but from the ones that I've worked with it seems like the best way to get there is to just stick with a routine/schedule as best as you can, but progress can be slow. You seem to have a really good system going with your sticker chart though, hopefully it keeps on working! Good luck, potty training can be SO frustrating. i'm also a special education teacher. i've gotten many many children (most with CP/non-ambulatory and exceptional cuteness) potty trained. we always start taking them to the bathroom every 15 minutes. it sounds crazy, but, we do. our chart is similar to yours (but much smaller scale) every trip to the potty with dry pants earns a sticker. when the chart is filled (usually 4-8 stickers) the child gets something - most often they get to take a walk to the office, go on an errand, school store..). we also FLOOD them with juice. they drink ALL DAY LONG. (i've heard orange soda moves through children the fastest, but we stick to juice/water/milk) all this drinking provides lots of opportunities for success, and wet pants, well, that's just another chance to learn. as we see them holding it longer and longer (or as we understand their own schedule) we'll increase the time to 30 minutes, 40 minutes. you might ahve to do that with eden. if you know that she can hold it 30 minutes, but not always 60, start with 30, work up to 45. it is hard. painful at times. but the pay off is big. i would certainly get her checked out, but, definately work on it. i'm sure she can get it. i'm wondering too, if her trunk is weak, perhaps her bladder is too. in which case, she may need to be toileted more often to be successful. wow. i really wrote a book. thanks for sharing H&E with the world. they're great kids - you and your hubby are doing a great job raising them. they're very lucky! I have to agree that pull ups do not give the wet sensation. I´m also a teache and we insist on regular underwear, there are training pants which have a layer of plastic on the outside, which may be good for home, and yes, you have to take them to the bathroom at least every twenty minutes. My advice for night training is taking her to the bathroom just before she goes to bed, again when you go to bed and if possible setting the alarm for another couple of times during the night. When I was potty training my eldest I was very pregnant with my youngest, so just got her up every time I had to go during the night and it worked a charm! Billie, you should give yourself a big pat on the back. You are amazing! Honestly, I would take a looong break from potty training and try again in another year. I know that sounds crazy but Eden is a smart little girl but her body just may not be ready. Holland will get the night thing down eventually. Don't stress! I am experiencing the exact same thing with my 4 year old. She goes poop in the toilet about 90% of the time and never asks to go pee. She also feels very bad and offers apologies when she goes in her diapers. She can't walk or crawl, but speaks well and seems fine cognitivly. Sorry - i didn't read all the comments so i may not tell you anything new. Being dry at night is a neurological thing. There is some gland in the brain (forgot the name, your doctor can tell you) which needs to mature enough for the person to feel the need to go to the toilet and then send signals to wake you up. Deep sleepers tend to be late with developing this gland, and it can run in families. In my hubby's family, the average age for night dryness is 11. There is nothing really you can do apart from waiting for that maturity, and making as little fuss as possible in the meantime. We use a mat (called slumberdry) which goes over the bedsheets and can hold 2 liters of water. It means changing the mat rather than the bedsheets. We also use Dry Nite nappies (thicker than normal pullups but pullup style). They look flat and cause no particular social problem at sleepovers. With regards to being dry during the day, get your doctor to check out the muscle function. Then you will know for sure if she can't do it or just can't be bothered. My daughter often is having too much fun and finds it easier peeing her pants. I try not to make a big issue out of it, but I do take ages changing her. When she signs for the toilet, I equally try to be as quick as possilbe. We play games listening to the wee wee sound as it splashes down... The aim is to make toilet fast and fun, and turn wet pants in some major time out where she is not having fun. The main thing is not to make it into an "issue". Kids are way to clever to realise this is important to you and will use and abuse it (and your two girls are smart cookies, so yeah). My last tip is to buy terry toweling pull-ups (K-mart has them here in Oz). They are jsut as easy to use as pull-ups, they look like undies, and they are easy to wash. Just buy heaps of them. I have on occasion tossed one out (into the bottom of the compost bin) when it had a particulalry yukky poo. Also, make sure you have plenty of wine, gin and tonic or whatever get you going at hand. Even if it takes years. You deserve it. I have no physical disabilities, and was potty trained at 2 (or 3?). I peed at night once or twice a year till age 7. After that I was trained... however one night when I was in middle school, I was dreaming that I had to pee but couldn't find a toilet. so in the dream I found a bucket and popped a squat, and started to go... needless to say , at age 14, after 9 years of being potty trained, I woke up at about 2am and felt myself wetting my bed!!! -- I quickly changed my sheets and put up a wash and never told anyone EVER, accept for right now, and only because I am anonymous and don't know anyone on here!! (I am 25 now). Anyway, the point of my story is, I am not sure, but I hope it made you smile! you really, really dont have to stress about not being potty trained at night at age five. seriously. there are kids who wet their beds until theyre 10. I dont think you need to push it for another year... as for Eden, you need to find out if she can control those muscles. I dont know how to find that out though. I don't think Eden's training can be chalked up to disability yet. My twins are on schedule for all their milestones, and I have shed more tears over potty training than any other part of parenting, including the NICU and RSV. I think the chart sounds like a fantastic idea, and it sounds like it's working. Potty training seemed mostly one step forward, two steps back for us, but I'm actually almost ready to call my girls trained. What does your pediatrician think? If you talk to other moms about it, I think you'd be surprised by how many kids are still have nighttime accidents at age 5 and even older. My parents' and grandparents' generation swear we were all potty-trained by age 2, but I remember potty-training my sister. She wasn't trained. We were! The adults were the ones thinking about her potty-going night and day. I think our generation really doesn't consider training complete until kids don't need reminders to use the potty. Forget the cultural expectations! I don't know if this helps, but my 5.5 year old full term daughter has just stopped wearing a pull-up at night, despite being potty trained during the day at age two. She sleeps so soundly that I sometimes carry her to the toilet during the night "just in case" if I think she drank too much before bed. Eden has done wonderful things to delight and surprise everyone! I believe she will do this too! I tried to read all the comments, apologize if this has been pointed out before......I am a nurse. If adults are experiencing incontinence shortly after urinating in the toilet, (particularly those with neurological challenges) one thing we check is to make sure they are able to completely empty their bladder. If they do not empty their bladder completely, their bladder fills us again that much quicker, and overdistension can cause incontinence. To do this, we bladder scan........the bladder scanner is basically a little portable ultrasound machine, non-invasive test that can be done by a trained CNA. You basically just press the probe right above the location of the bladder (bikini line) and press a button and it tells you about how much urine is left. I honestly don't know if this is an issue for children with CP, but in case it is helpful.......a urologist could do it easily during an office visit. S.
Thanks Billie for posting this and it has been great reading all the comments from your followers. We are at the same stage, 4.5, can tell me he is peeing/pooing and has peed and pooed. We need to get to the " I am going" to pee poo! I understand your frustration completely and know how hard it is. You know our story girl! Took a while but Ben got there. Hang in there though. I think that there is a lot to be said for teaching and showing that you are confident that one day she can do this on her own. You are giving and supporting the tools so don't sweat the outside pressure, "they" don't live your life, "they" don't know your story and in the grand scheme of things, "they" don't matter. Hugs to you all! K says HI! I've read your blog for a long time but haven't posted before. I am the mother of 6 children and someone who many people have turned to to potty train. I am also known to be pretty hung up on it in terms of people being lazy and not training their kids until they are older.. now wait.. keep reading..
To me, reading your post, it sounds CLEAR that they are doing the best they can. You can not teach a 5 yr old to wake up to pee.. it just is not going to happen. You can limit their water intake a couple of hours before bed if the problem is she is getting too much to drink right before bed and then not waking but I'm guessing she is just not feeling the signals and waking and really.... you are going to be fighting a losing battle if you stress about this. As far as Eden.. please, please, please, please.... don't feel bad. To me, the fact that it can be 1/2 hr after she has went or is already wet tells me that she doesn't have great control there. She might be five but it doesn't matter if her muscle control isn't great. She, very well, may be doing her best and I hate to think that she may feel it just isn't good enough. You push when you know a kid has control and knows what they need to do. I'm sure she does know what she needs to do but she may feel the urge and bam.. have to go. And also.. imagine how frustrating it is for her as well when it is bathroom trips every single hour. I wouldn't stop pursuing it. But I would try oh so hard to not punish her AT ALL. Just to tell her 'it is ok-I know you are trying and we will get there'. I think you are right and most people will expect them to be trained but I'm telling you.. i have a TON of experience here. (I also owned a daycare for 10 yrs) and I would never ever expect her to have success. Ever. You aren't dealing with the average 5 yr old. There are muscle issues here and it would only make sense that her urinary track system would also be delayed. Be easy on yourself. You are not doing anything wrong or bad and if people don't understand.. that is their problem and not yours. Finally.. I have a nephew who is severally retarded. He has a missing chromosome which leaves his unable to talk or function on his own. He can't bathe himself, can't dress himself, can't get himself a drink etc. My mother would get upset with my sister that he wasnt' potty trained. Finally when he was 20 my sister was not able to care for him for a few weeks and my mother took over care until she was better. She immediately took on the task of trying to potty train this 20 yr old man who was 200lbs. And she had him trained within a week. So yes.. it is very possible and my nephew should have been trained years and years ago but it is what it is. Go easy on yourself and your babies. I have a feeling Eden is trying to accomplish something that her little body is just uncapable of doing at this point. I think the pooping-in her case, might even be a bit easier for her to catch because poop just doesn't 'fall out' so she may have a bit more warning or sensation to get to the potty so I think you can push this harder and have her completely poop trained before she is trained to pee. Have a great day, kiss your beautiful girls and pat yourself on the back.. you really do a wonderful job! I can't offer much advice but I would like to say that there are a ton of advertisements on TV for diapers for older children, so don't feel like this is just your problem or a problem at all, because it looks like it's quite common, disabilities or not. I just started biofeedback training with my 4.5 year old preemie who has low tone and sensory issues. Biofeedback teaches them to be aware of the pelvic floor muscles and to consciously strengthen and control those muscles. That way, they can learn to empty completely, to hold it if they need to and to recognize when they need to go. Until my child is more aware of what's going on down there, I think we will just keep spinning our wheels on potty training. I have put us through the humiliation of trying "potty training in a day" mentioned above. I strongly recommend against it. I've heard that sometimes kids are not fully night time potty trained until age 7 or after...that is why they have the "cool" night time pull ups that look like shorts instead of underware...for those older kids. You should not "feel bad" that others will think you are a bad parent ever! It really doesn't matter what others think and as so many have said...you are an amazing mom and very inspiring to all moms out there regardless of the abilities of thier children. We used the "cool sensation" pullups when potty training which makes the pullup uncomfortable to wear when wet. Might work with both girls. They come with Disney Princesses and Cars on them as an added bonus! When I was very young, my cousin wore a bedwetting alarm that woke him up in the middle of the night. I was too young to know how it worked, but it might be something to look into with Holland if you're concerned. I assume it was either a sensor that could tell when his bladder was full or when he started peeing. Never let anyone else make you feel like a bad parent. If they are judging you based on your 5 year-old's potty training then their opinion just isn't worthy of notice. Now on topic: keep on keeping on. Eventually it just clicks for children. And every child does that on their own schedule. Accidents are common, particularly because they can become very engrossed in other activities at this age. Also, muscle control can be a very difficult thing to get on top of, just continue to be patient. My kids were closer to 6 before they stopped entirely! It will happen, I know because you are more than halfway there already! I would take Eden to a urologist and have urodynamics testing done to determine whether it is physically possible for her to be potty-trained in the conventional sense of the word. My youngest has spina bifida and will never be potty-trained like a typical child, but there are medications and other avenues one can take to achieve social continence. I'd really recommend talking to a pediatric urologist to get some help. As for nighttime dryness, some kids are WAY older before they get out of pullups at night. Of my 6 potty-trained kids, I had 2 who would have occasional nighttime accidents until they were teenagers, 1 who was completely dry at night by age 3, 2 who wore pullups until they were 7 and one who is still in pullups at almost 6 years old. It really does vary and it's a developmental thing that you cannot teach or force. Try to not worry about it and just give Holland a pullup for now. I don't have much advice when it comes to potty training a child with cerebral palsy, as that is a hurdle that is still in our future. But I can tell you that with Gabe (Ari's twin, 2 1/2), we got him potty trained at night by putting him in a Huggies pull-up at night (no diaper) that turns cold when it gets peed on. The cold sensation woke him up to alert us, and after a couple incidents like that, he caught on. But it has to be that kind, because as I'm sure you know, regular pull-ups are basically just diapers. The cold does the trick. Then, straight to underwear at night, because the wetness should wake them up too in the rare event that they slip up. Hopefully, that may help? My children is not old enough for me to give sound advice, but I think you are a doing a super job. You are a very good mom! My daughter is 12 and has muscular dystrophy. She is completely potty-trained, but any time she is struggling with weakness (more weak than usual), she also has trouble staying dry. My opinion is that it is related to the weaker muscle tone. Perhaps your daughter also does not have strong enough muscle tone yet to control this reliably. I know this is super late, and I don't know all of Holland's and Eden's issues, but I wanted to share my daughter's experience. She is now 7, was a 26 weeker, and was having TONS of accidents at age 5. Same thing - wet often, understood the concept but could not do it. She is dyspraxic and has low tone, and lots of GI trouble. On the advice of her neuro, we went to see a pediatric urologist, who did some tests on her bladder and sphincter muscles. She had to drink some radioactive stuff, they took some pictures, and they put a sensor on her privates to check the muscle response (sorry if that's TMI, I have a kid that needs tons of prep, and the sensor was not a popular event....) Long story short, she had bladder spasms. She took a low dose of ditropan, which solved the problem. Trained within 2 weeks daytime, and within 6 months night time. We were able to wean off the meds in just under 2 years. Just a thought in case this is something that sounds like it might fit your situation. Pooping accidents were controlled with miralax (for timing). My oldest son who is now 11 just stopped wetting the bed at night at 10. He was easily potty trained during the day, but was NEVER dry at night. Not once. The pediatrician (at the same office as yours) said use pull-ups/diapers at night, and don't worry about it. They won't even talk about treating kids for nighttime bedwetting until 6 or 7 years old. And that's when Dr. J (who is no longer there, but I know you saw him, too) gave us a pamphlet on an alarm that someone else mentioned, also, to use from www.bedwettingstore.com and when my son was ready to use it, it worked a miracle on him. It took 2months and he was dry at night, but he wasn't ready before that. Don't worry yourself about it--there's not much you can do about it when they are so little. For Holland, I'm sure it will come eventually. Lots and lots of kids are wet at night--it's just that most people don't like to talk about it. Now, about Eden, I have no idea since Adam is 4 and doesn't care if his pull-up is so wet it's falling off of him. One day I decided to let it go and see if he would tell me when he was wet enough that it bothered him. He never said a word and the thing weighed about 10 pounds--and he doesn't have a physical disability to contend with. We'll try again in a couple months. Eleanor on the other hand was potty trained in a week at 2 years 11 months. Crazy how different kids can be. First of all, THANK you for your post!!! You have just reassured a LOT of moms who have been worrying about this very same topic. As a dr and as mom of a child with special needs, I agree with the previous comments -- especially about bladder maturity and enuresis. I would say Holland and Eden ARE potty trained - they understand the process and have had a lot of success (just look at that chart!). Accidents happen. Part of the problem may be society's definition of "potty trained." If you ask 100 parents of preschoolers, "Is your child potty trained?" a fair number may say yes. However, when you ask those same parents specifically about accidents, the number of children who are completely accident-free is only a fraction of the original number. Personally, I feel the age that experts quote as "ready" to be potty trained is skewed. Not only is there a recall bias when you do surveys, there is also an inherent competitive aspect among moms. Someone may brag that their child was potty trained by 3 yrs. The mom beside her will say her child trained by 18 months. The mom with a 4-5 year old who still has accidents, clams up and doesn't answer the survey because her child doesn't measure up. The mom of a 7 y/o who has nighttime accidents cries silent tears and feels she has failed. Then there is the mom of a child with special needs trying to understand what is "normal" for her child. Anyhow..the others said it best. It sounds like your girls are right on track. Potty training isn't an absolute, nor is it a linear process. You probably won't even notice progression or successes until weeks/months later. All the best! Thanks again for sharing your story with us. Your daughters are BEAUTIFUL! 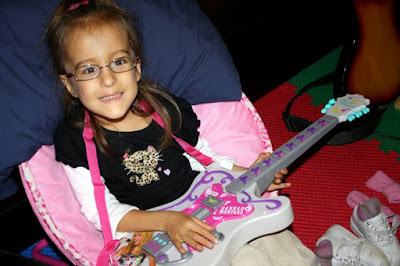 7 year old girl- cerebral palsy- cant talk, control movement, eat on her own, walk, crawl, etc. but she wear underwear- and stays dry. it took her until 5 1/2 years, though. keep trying. eden's impairments are significant, but not so much. shes really lucky. I am late to this, but still wanted to comment. My preemie does not have the issues your girls do, so I can't offer any suggestions regarding day time potty training. What I CAN tell you is that our ped told me that 10% of full term 7 year olds (yes, I had to worry about this at the 7 year check up.) still wet the bed. In fact, our ped does not not even start to worry about this issue until a kid is 7, and that is only if the family wants to do something about it. You have more than enough to fill your plate. Whether or not your girls need pull ups at night for a few more years should not be an issue. Definitely ditch the pull ups. Try some cloth diapers for a little while (with flushable liners to catch the poop) and see how they like feeling the wetness. We are working on Elena...she is 4 1/2, and almost (?) potty trained. By that, I mean she rarely has accidents. With her physical disability (she has mild spastic diplegic CP) getting her clothes off is still a problem, as is actually getting on the toilet, and getting off and getting dressed can be problematic. Hmm..that is a LOT of the toileting process, no? She is making a lot of progress now, meaning she can usually pull pants down/up by herself (but moving up to the toilet seat with pants down is a whole other challenge). We are *hoping* that maybe she can be fully self-sufficient in the bathroom within a year. We went for 6 months without an accident. Then, when she started school this fall, BANG! Accidents about once a week or so. I don't get it. It's not her first year in school, either. For the most part, she doesn't have accidents at home, only at school. *ugh* this is long. Just want you do know you're not alone. I'm sure your girls will get it! Haven't posted before but this is such a topic with so many parents. Don't stress over it - the girls will feel your stress and it will be more difficult for all of you. My "normal" daughter was not dry at night until her early teens. She was tiny (27 lbs at age 5) and her doctor said that as small as she was that her bladder simply was not mature enough for her to make it through the night. She was tested as a preteen and put on medicine (I can't remember what it was - just that it was a nasal spray) that really helped. She was about 14 when she was finally consistently dry at night. Now at almost 27 those days are a distant memory for both of us. Hi, I have been following Holland and Eden for awhile now. I found your blog from a friend's blog. I am a 27 year old woman with cerebral palsy. I was late to potty train. And at the age of 19, started having bedwetting problems again. My urologist has told me that the messages just don't get from my brain to my bladder in time before I wet myself. I have slight leaking problems during the day too, so I wear a pull up. A lot of kiddos with CP can, and do successfully potty train. I am very smart, as it sounds like your girls are, but my muscles (due to the CP) just aren't strong enough to hold all the urine all of the time. Please don't get down on yourself, as cultural norms are standards set without disabilities in mind. But, never give up. My son is 8 and was still having accidents at night. We now have a buzzer that attaches to his underwear and buzzes at the first sign of dampness. He sleeps so soundly that his brain simply does not wake up enough. With this buzzer, it wakes him IN THE MOMENT that he is having an accident. It truly is training his mind and he is finally having less and less accidents. It's been a month 1/2 an we are finally 80% there. He also was having bowel accidents during the day until age 7. It was infrequent but did happen, even at school. Something finally just clicked with him regarding this. Best of luck to you. We have a preemie in NICU on the vent currently and your posts over these years has been wonderful to read. I have been a lurker for a while but I don't think I"ve ever commented before now. I just wanted to know that your post and all the subsequent posts have helped me ENORMOUSLY. I copied your toileting chart for her. AND IT WORKED!!!! Today is her first ever day of being DRY - all day. And she's 6-1/2 years old. All credit to you for giving me the courage to try and make it happen. Yes, it has taken months since your post but tonight I'm the proudest Mamma on the planet. Thank you for your brilliant blog. I am truly grateful for you taking the time to tell the world about Holland and Eden as you've helped our family enormously! Did I Mention They Can Read?